The first thing you have to understand about Life Itself, Steve James’ biographical documentary about Roger Ebert, is that James is hardly a dispassionate observer. He was not a close friend to Ebert, but he owed a lot to the famous film critic. 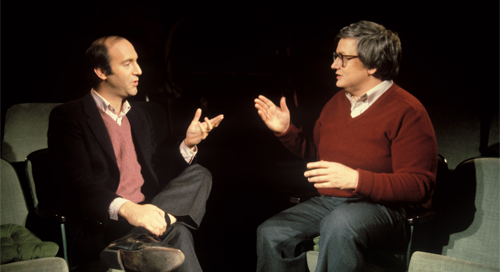 It was Ebert, and his partner Gene Siskel, who championed James’ first feature, Hoop Dreams, and made him an important filmmaker. The next thing you need to know is that Life Itself is no rehash of Ebert’s autobiography. The book, like all autobiographies, is told from one point of view–Ebert’s. The film shows Ebert’s life from many points of view. Friends, family, co-workers, filmmakers, and other critics–some of whom didn’t care much for Ebert–get their chance to discuss the brilliant writer, passionate cinephile, and overweight alcoholic who became the first film critic to win a Pulitzer Prize, and then the most influential film critic of all time. And one of the best. Overall, the film gives us a far more positive view of Ebert than modesty would have allowed him to say about himself. But others can gush about Ebert’s fast yet concise writing style, his advocacy for rare and wonderful films that might never have had a chance without him, and his enthusiastic lust for life. And, of course, his courage in the face of cancer and the botched operations that robbed him of the ability to eat, drink, or talk. James started working on the film just before Ebert went into the hospital once again, in what they didn’t know at the time was the beginning of the end. As it turned out, this was the beginning of the end for Ebert. The film cuts between two timelines–the physical deterioration of his last months and his entire life. Obviously, the two stories come together in the end. Be prepared. This film spends a lot of time looking at a man without a jaw. Well, he sort of has a jaw–a u-shaped piece of flesh–sans bones and muscles–hanging below his gaping mouth. And when you look into that mouth, you see his neck or, depending on the camera angle, what’s behind him. It’s pretty disturbing at first, but his upbeat and joking personality helps you adjust. We hear a lot of Ebert’s words in Life Itself. Sometimes, they’re from old recordings. Sometimes they’re his computer voice. Other times it’s an actor–one who sounds very much like him. The film has another hero: his wife (and now widow), Chaz. Ebert didn’t marry until he was 50–to a woman who already had grown children. It’s clear that she has been his rock through the tribulations of his final decade. It’s a touching romance, and like all near-perfect love stories, it has to end in death. Steve James has given us a completely biased look at Ebert’s life. But it’s also an entertaining and informative work about a man who joyfully embraced both the pleasures of cinema, and of life itself.